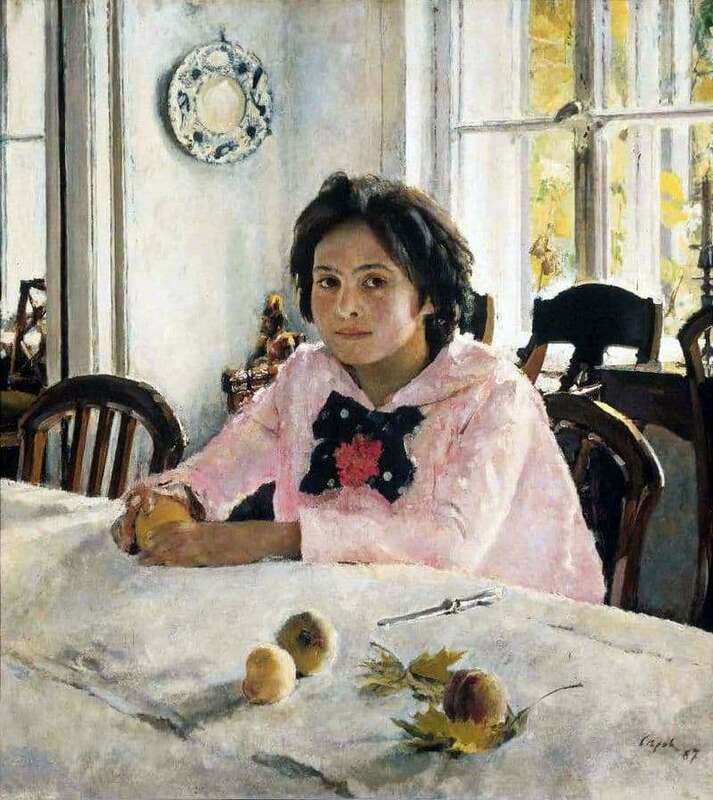 The famous work of the artist V. Serov – the painting “A Girl with Peaches” was painted in the summer of 1887. The heroine of the portrait is the daughter of a famous entrepreneur and patron of the arts Savva Mamontov – Vera. The girl was only 12 years old when the master took to paint her portrait. The job was not easy for him, and it took him three months to complete the canvas. But in the picture itself this cannot be said: it is so penetrated by lightness, airiness and light that it seems that it was created in one breath. Vera seems to be sitting still, carefully looking at the viewer. But in her dark face, on which a blush appeared, in dark disheveled hair, it is noticeable that just a few minutes ago the girl was playing in the sun-drenched garden. Another moment, and she breaks away, like a butterfly from a flower, again in the garden to play with the children. And this very moment was seized by a talented artist. What else can the picture tell us? If you look closely, you can see that the tablecloth is wrapped up and neatly laid so that its edges do not hang from the table. Usually they did this in those houses where there were small children, so that they could not pull the end of the tablecloth and overturn everything that was put on the table. It is on this lapel are peaches, a knife and a pair of maple leaves. Apparently, the peaches were just brought here by Vera to treat her playmates, or maybe her younger brother or little sister. She probably needs a knife for this: you need to cut a peach and get a bone out of it. And the leaves are improvised plates for the halves of fruit. If you look into the eyes of the girl, you can see that she has a mysterious look, there is even something of a gypsy in him. Faith is charming and spontaneous, in her appearance one feels that she is a real instigator among children. And now she found an extra minute to grab a treat for everyone from the winter canteen. Her face is radiant with happiness, and so is everything radiant around her. That is why the picture seems so harmonious and vital. Thanks to the techniques taken from impressionism, V. Serov was able to inimitably convey the play of sunlight, its saturation, and even what is difficult to draw properly – the airiness and the transience of the moment. “Girl with peaches” gives the viewer a sense of joy and happiness. taken from impressionism, V. Serov was able to inimitably convey the play of sunlight, its saturation, and even what is difficult to actually draw – the airiness and transience of the moment. “Girl with peaches” gives the viewer a sense of joy and happiness. taken from impressionism, V. Serov was able to inimitably convey the play of sunlight, its saturation, and even what is difficult to actually draw – the airiness and transience of the moment. “Girl with peaches” gives the viewer a sense of joy and happiness.